ask patrick: ...about bringing it home. 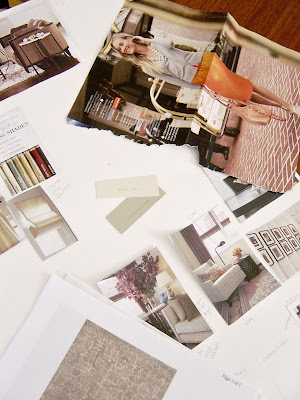 It’s usually the people who need my help the least that I’m most excited to help (like Randi and her “work in progress”), just because their distinct vision, great start, and love for interiors make them fun clients. Lacy, and her Connecticut home she shares with handsome hubby and adorable Golden Retriever, was no exception. Spread out on the dining room table (shortly before WARM SCONES!!!) were Lacy’s inspiration images (including one of my very own projects!). As is often also the case, the connections among the images were far more apparent to me than they were to the homeowner: The images were a mix of modern and not-so, often in otherwise traditional rooms. There was a collected feel of woods, metals and stones. There was a vintage vibe, but not MCM overload. The palettes were calm and sophisticated, but warm and earthy. The rooms felt “traveled,” with faint (not theme-y) traces of exotic locations. There were mixtures of rustic and refined, beautifully illustrated, too, in a book on African Safari style: elegant English set-ups, with dark woods, beneath canvas tents and surrounded by natural elements… including the wandering leopard and passing zebra. Even while showing off her amazing thrift and Craigslist scores, there were more common denominators than dissenting opinions. A tea set was elegant but far from uptight, great shape and banded simply in gold. A knife set was both burnished and modern, but softly so. So what does Lacy need to do to “bring it home”? Since I still have those scones on the brain, here's the baker's dozen steps I’d take. 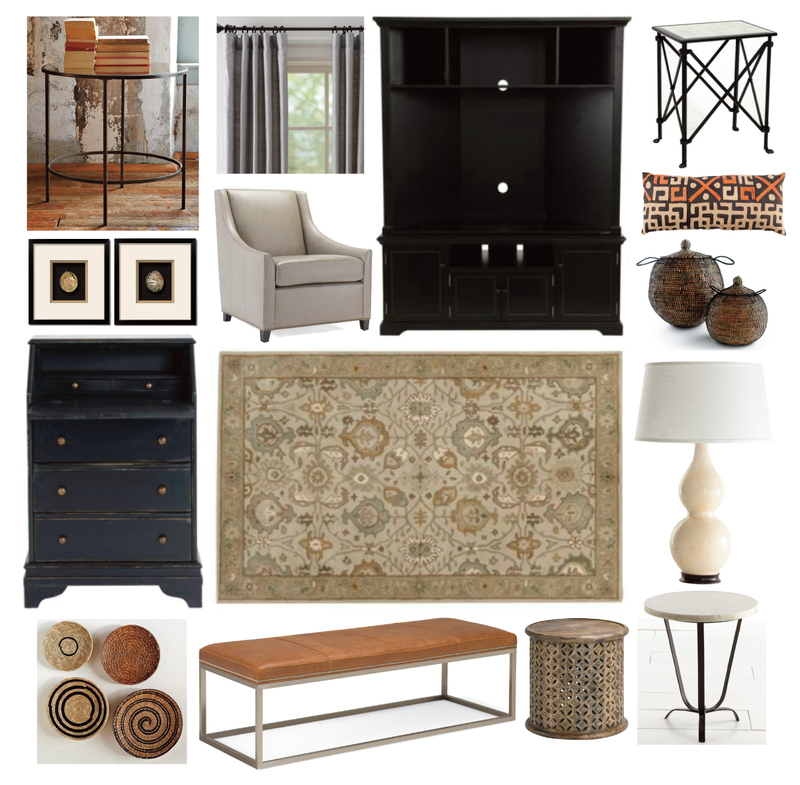 Clockwise, from upper left: Foxed Mirror Side Table, West Elm; Silk Dupioni Panels in Gray, Pottery Barn; Reston Corner Media Cabinet, Ballard Designs; Olivia Glass-Topped Table, Ballard Designs; Kuba Cloth Kidney Pillow, Wisteria; Pair of woven baskets, Horchow; Hourglass Lamp, Wisteria; “Sleek” Marble-topped Side Table, Wisteria; West Elm’s Carved Wood Side Table; Duncan Leather Cocktail Ottoman; Decorative Bowl Wall Art, West Elm; Medici Secretary Desk, Ballard Designs; Pair of Polished Pink Abalone Shells, Art.com; Sweep Leather Arm Chair in “Elephant,” West Elm; Catherine Rug, Ballard Designs. In any gathering, whether dinner party or cocktail soiree, you want the guests to have a lot in common. But not EVERYTHING, or else, you’ll be hosting a real snoozefest. I use that theory in room design: every room is a party, and everything you purchase to fill it is a guest. This theory has gotten me past lots of roadblocks, and it will work for Lacy, too. So start by inviting someone for anybody who’s already on the guest list… so far, the ivory sofa is the only ivory in the room, which makes it a little lonely. 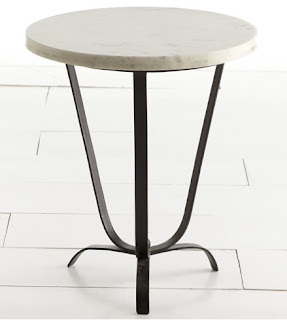 Whether in stone tabletop or even a lamp or lampshade, give that ivory somebody to talk to! And it does NOT need to be an equal quantity. One lamp, across the room, in a great shape, could be plenty. 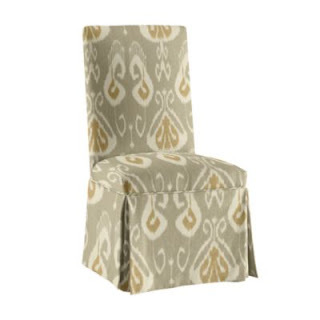 Then invite in someone a little louder (an accent color on a chair, a pattern on a pillow)… the proverbial life of the party… which, usually, is best in small doses! You can also look at it like a big game of Compare and Contrast: everything should have something distinctly in common with something already there… but also some definite difference. Case in point: The exposed wood arms of Lacy’s pair of vintage chairs plays well with the warm wood floors, but they are more modern than the room itself. It’s the perfect tension, without feeling tense. Lacy has done the right thing: kept her biggest upholstery piece a neutral (with a great chunky texture, btw, keeping that neutral from falling flat). Which starts off the room with gray walls, an ivory sofa, white molding, and warm-wood floors. So the next decisions (window treatments and an area rug for the living room) need to build from these givens (who are we inviting next to the party?). I call it "Weaving": combining the elements of color and existing material, and weaving them into your next decision. 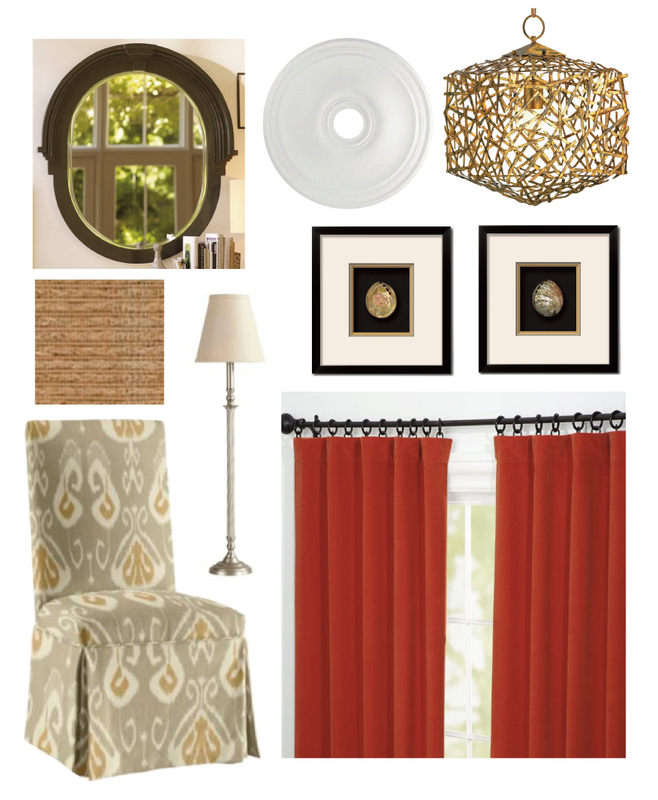 On the windows, Lacy was already considering one of my very favorite treatments: woven natural shades. 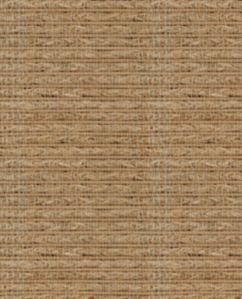 Using the “Weave” approach, we narrowed down her choices quickly… the winning “Seaview” from The Shade Store was both the cool gray on the walls and a touch of the floor’s woody warmth. Inside-mount grass shades are the perfect choice for the “base layer” of the entire first floor… since privacy is not a huge issue. They bring the floor’s warmth up onto the walls, and they also demystify the tricky bay window trio (read on to see what else is in store for the other windows). 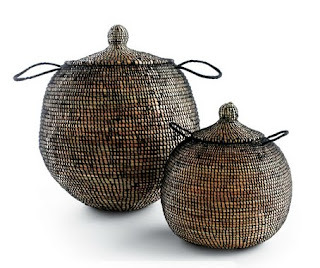 And the bonus is that natural materials, like these woven grasses, are highly forgiving when it comes to pairing with other materials and colors, since they really work as a neutral. Plus, I LOVE the humble material against the windows more stately moldings. They also look cool and coastal in the summer, warm and reedy in the fall and winter. 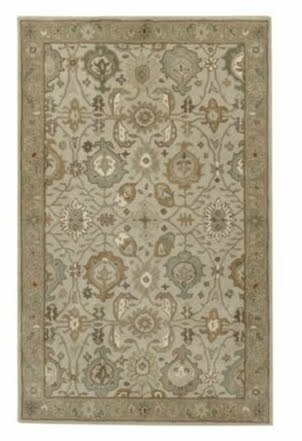 For the floor, and to give Lacy a jumping off point for more color than is already in the room, I’d do a modern take on a traditional carpet (my favorite place to turn to create a color scheme) like the Catherine rug from Ballard Designs. What makes it modern? The tan and gray palette. Its broad tonal range also opens the door to making lots of other stock upholstery and pillow choices work, a great trick when you can’t rely on custom choices to precisely match a textile color. This tidy and sweet house, a lovely balance of traditional rooms and open-plan modern living, has created some great framed “pictures” (or the makings of them! ): The view from the living room into the far dining room wall, the view from the sofa, the view from the kitchen into the dining room…so those are the opportunities for great color and solutions to attract the eye. To stretch a budget and get the most impact fastest, I’d focus some attention, and make the biggest statements, there. 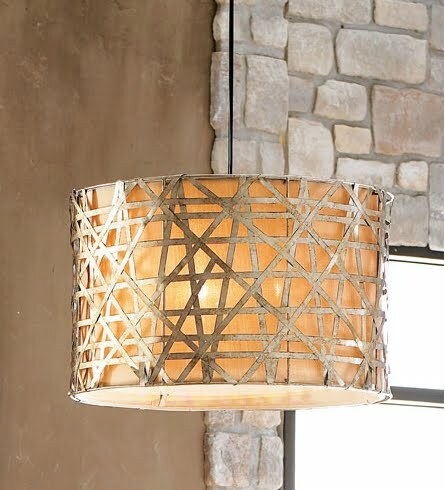 These are the places for a showstopper light fixture, a color risk, a fabric splurge. 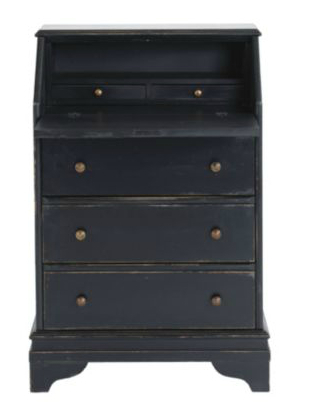 Let your rooms tell you where the eye, attention, and money should go. To find the “pictures” in your own home, get your camera out! Imagine the Afters… and where you’d take the best pictures… if that doesn’t help, pick up a magazine and see how the photographer has framed a shot... and why. 4. When is a Doorway Not a Doorway? When it’s wiiiiiiiiiiiiide. Here, the double-wide opening between living and dining rooms does a nice job of separating the spaces but not stopping the flow, and Lacy has already taken a step that most won’t, and it’s the right one: use part of that opening as a place for furnishing. She’s floated one of her pair of gorgeous vintage chairs here, and while I think those chairs would work better as a pair at the bay end of the room, I’d replace the one floater chair with another (perhaps armless) that looks good from front, side and back. And don’t be afraid to use something with a higher back here: It will help define the room’s boundary, even if the eye still wanders past it. 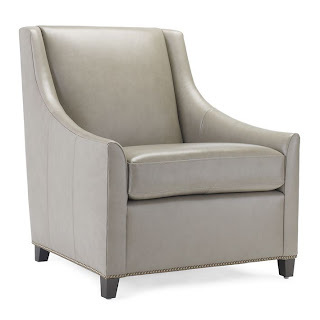 One of my favorite chairs on the mass-market today is the West Elm Sweep Chair, and the fact that it’s now part of their custom upholstery program has made it even better. Here, I’d do the stock “Elephant” gray leather, to play up the grays of the rug, but you could make a case for the Honey and Ivory leathers here, too. But since we’ll probably do a cream-stone or caramel leather coffee table, I stand behind the Elephant. Well, maybe beside the Elephant! Lacy has one of the best eyes I’ve come across when it comes to thrift stores and online classified ads, and the green upholstered chair in the living room is a great example. But its deceiving scale (it’s lonnnng in the seat!) means it may need another home elsewhere in the house. That sets the stage for pairing her other two chairs side by side, with a table in between them, my first choice of where this handsome duo should park at the party. 6. Don’t Leave it Hanging. 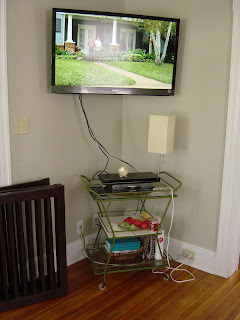 Lacy admits that the TV is too high… but it’s all hard-wired, with an outlet that would show if the TV were brought down to a more comfortable viewing height. 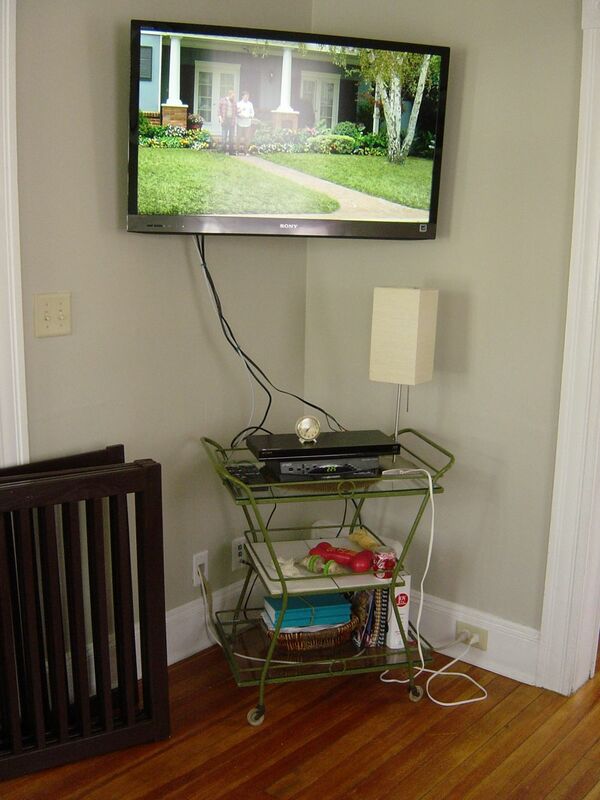 So aside from rewiring, I’d use a piece made to NOT hang the TV… and choose one that’s designed to work in a corner. That makes the top candidate the Reston Cabinet from Ballard Design. Don’t think that putting the TV in a larger piece gives it even more importance. Actually, just the opposite, as the piece itself, not the TV, is what you’ll notice first. 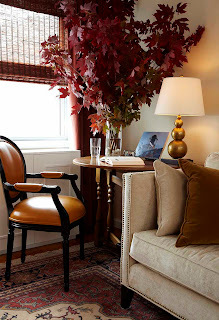 And the room will be the richer for the warm wood tones. 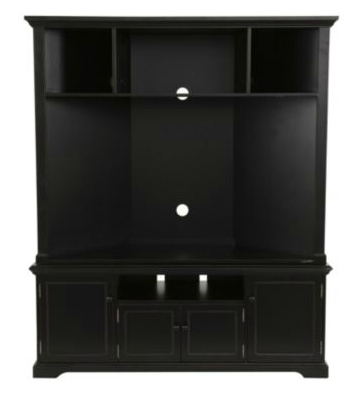 That TV, especially if in a larger dark wood unit, has the potential of throwing the whole room out of balance, visually, even if the intent is to make it a focal point. So on the other side of the entryway into the room, let’s get some visual weight there. 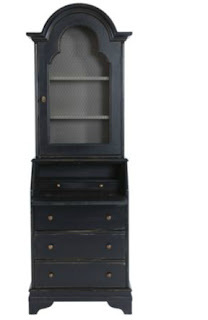 There’s opportunity on that prime slice of wall between entry and windows for a great little étagère or secretary, like the Medici Secretary with Hutch, and the balance would benefit from some height. But height is achieved not just by the piece you pick… it can also come from what you put above it. Because this room has few walls for art (and fewer by the time we get done... keep reading!!!) I’d go with a shorter piece like the Medici, but without the hutch, and a great, substantially framed piece of art above it, linked with a lamp. 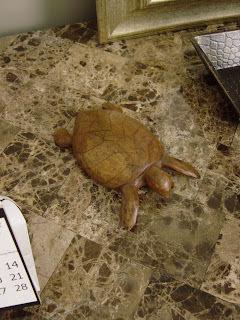 For Lacy, my very first choice of art would be framing a charming wood turtle picked up from a local craftsman on an island getaway. The rustic piece, framed in a modern shadow box, above a more traditional piece, and this one corner has all the room’s attributes rolled into one. 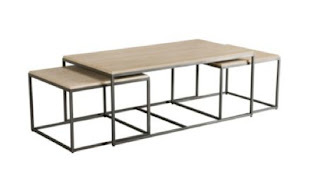 Plus, it gives a place to set up a bar for some casual entertaining. 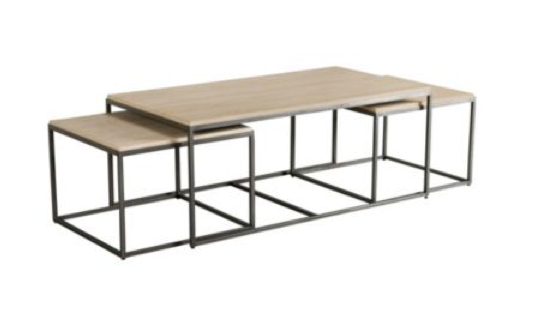 The two pieces (for the TV and the the desk/chest) should match in wood tones, but don't have to be a matched set. 8. Lead… and Supporting Roles. Adjoining rooms, even if open plan, do not need to have identical color schemes. But there should be some commonality and flow. My trick is to swap the “Lead” and “Supporting” colors in adjoining rooms. 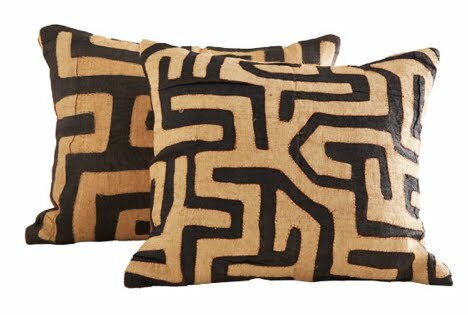 The living room’s mostly cool palette can use a tiny touch of earthy warmth, like the rusty accents on Wisteria’s Kuba Cloth Kidney Pillow, perfect on the sofa, or their Kuba Cloth Pillows on her vintage chairs or doorway chair. 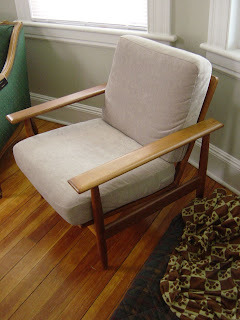 I’d also throw a warm color onto the wood-armed pair of chairs when it’s time to reupholster. 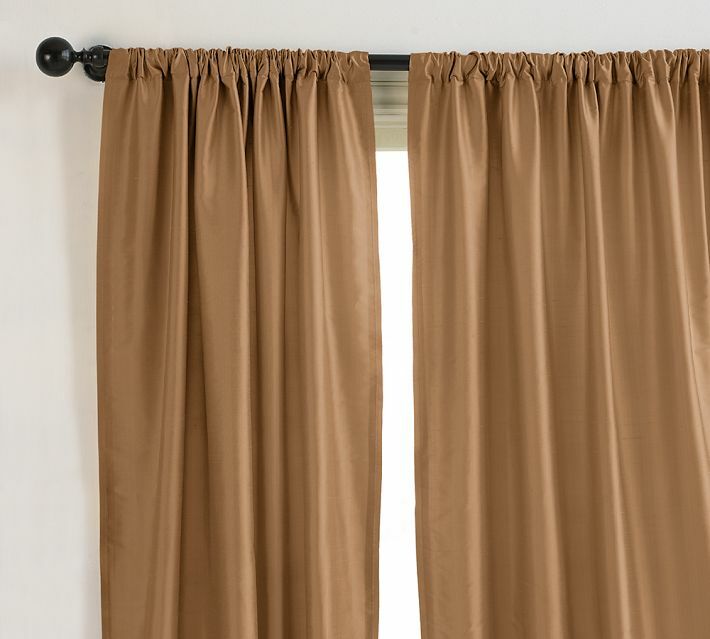 Their pairing, at one end of the long combined space are then the perfect companion and balancing element to the drapery panels at the far end, so relate those two fabric choices. And I’d bring some of the rug references (gray, and pattern), which is a star player in the living room, into the dining room’s supporting cast: Two Parson's Chairs, in Ballard Designs' Toscana Ikat in slate gray, cream and camel fabric, at the table’s ends, and the party is really getting started. 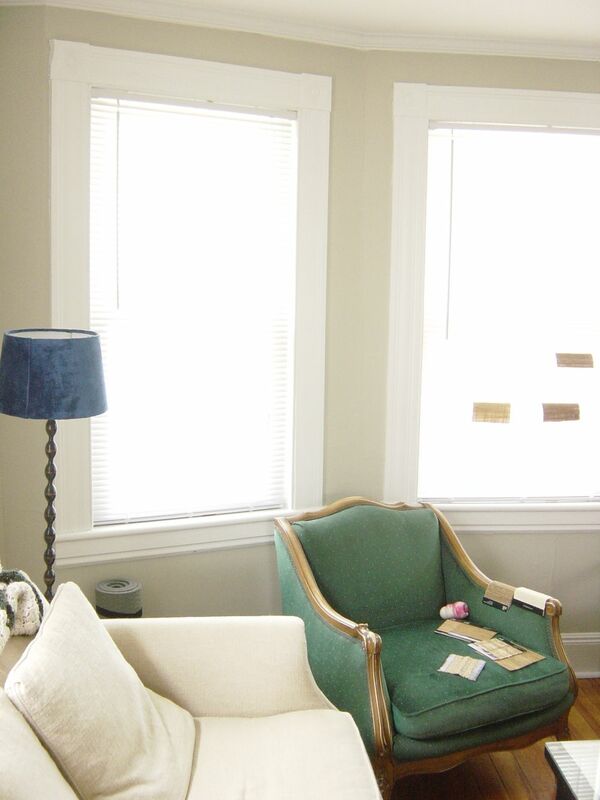 These two upholstered chairs work well with Lacy's existing side chairs, on which I’d do a DIY reupholster, popping off the seats and brandishing a yard or two of fabric and a fully loaded staple gun. Don’t feel like the seats have to match the other chairs… I’d reference the curtain color, instead, or something that marries the two. 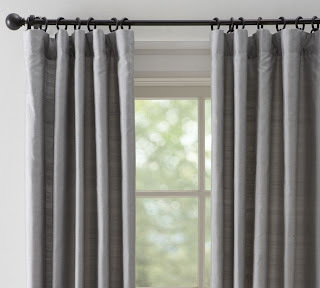 So the side dining room window doesn’t feel underdressed, I’d do a fabric valance (outside mount) in the same fabric as the stationary panels…. 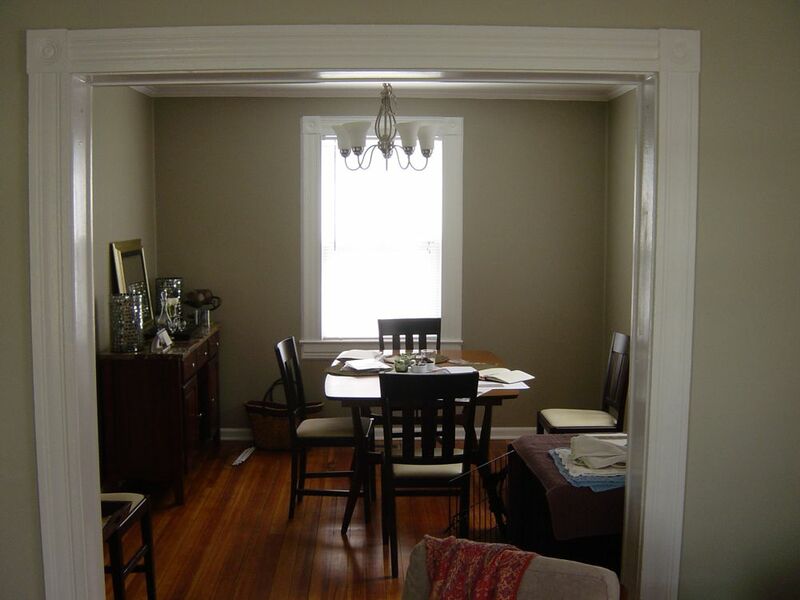 And, paired with an amazing light fixture, our “picture” from the kitchen in to the dining room is done! Two windows seem under-scaled for the role they need to play in the room. On the end of the dining room, that smallish window needs some backup for it to take the starring role it deserves, and to paint the picture it’s already starting to, based on prime visual location alone. 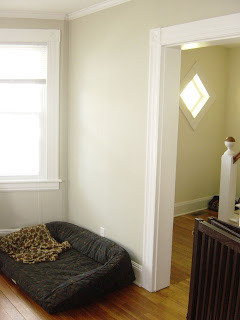 On the side wall in the living room, the couch seems to teeter on a small center point window. Since window replacement isn’t in the credit cards, there needs to be another solution. And that solution is window treatment trickery. 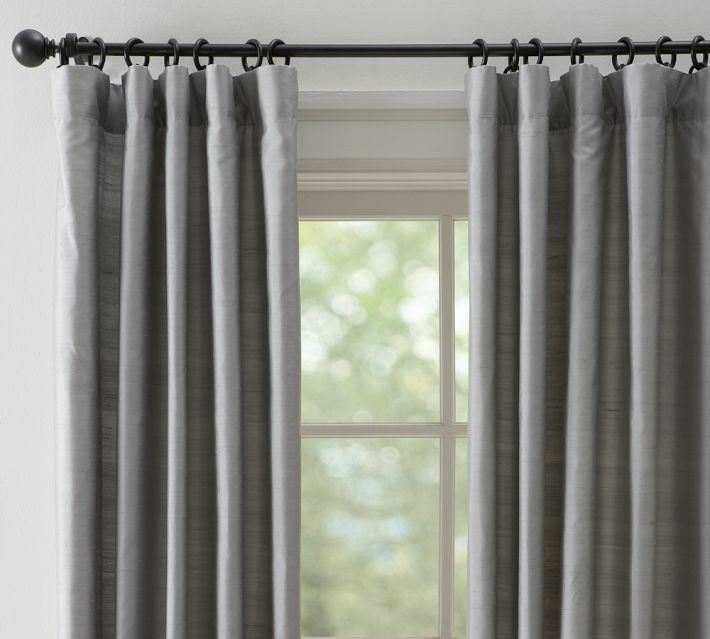 For both windows, a rod stretching far past the window frame then hung with stationary hanging panels will give the windows more visual weight, introduce more softness and color into the dining room, and give the couch a suitable backdrop. For the illusion to work on any window, the panels need to cover the window’s side frames all the way into the glass, making it appear the windows are far wider than they actually are. 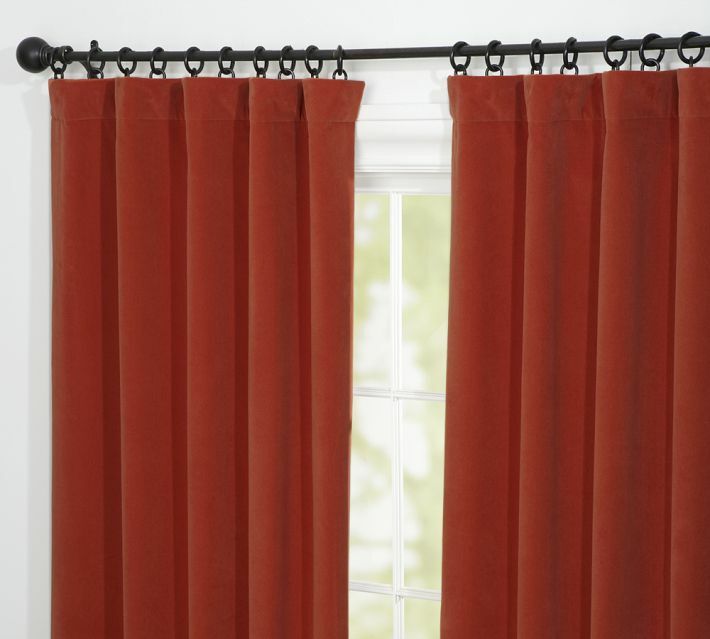 Rods should be mounted about a third of the way down in the space between crown molding and window frame, and fabric panels should be ample enough (you may have to double up on store-bought panels) to give the illusion they could be pulled closed across the entire expanse. 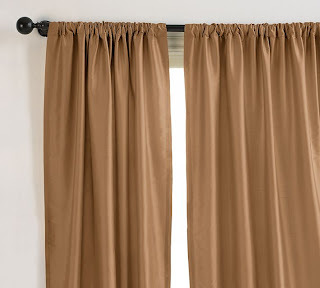 Dinky drapes won’t do! It will look like you ran out of money. But while the dining room windows should be dressed in warm-toned panels (like the Deep Amber Dupioni already mentioned, or these Velvet Panels in Maple Leaf... and the room is big enough to handle the wall-to-window contrast), I’d go with something cooler, and closer to the wall color in light/dark value for the sofa wall, like Dupioni Silk in Gray, or West Elm's Silk Panels in Pewter in the living room. But the living room panels don’t need to match the wall color exactly… just close in value, so they're not too contrasty. I’d actually pull one of the rug’s grays up and into the room. The panels and hardware should be pretty close to the sofa’s full width… or even better, just a bit past. Don’t panic: you CAN put side tables in front of drapes, even with lamps on the tables! 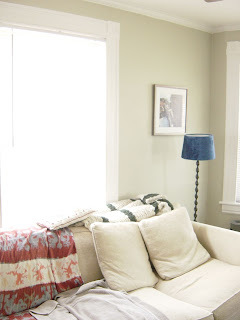 As noted before, this window trick in the living room means a tiny bit less space for hanging art. But the sofa-grounding balance, and-room-enveloping coziness it will give overrides that. 10. Phase it In, Phase it Out. Not everyone can throw everything out and start over. Nor, generally, should they. So I always look for ways to temporarily transition or repurpose existing pieces. Since Lacy wants a new coffee table, (I agree the two cubes are too chunky and traffic-stopping where there are now) they make perfect interim side tables for the sofa (even if they're a little low). Their dark finish, even in small amount, helps hold their own against the TV wall’s dark woods and big screen. So what would I use for a new coffee table? Something leggy (let that rug have its star turn!) 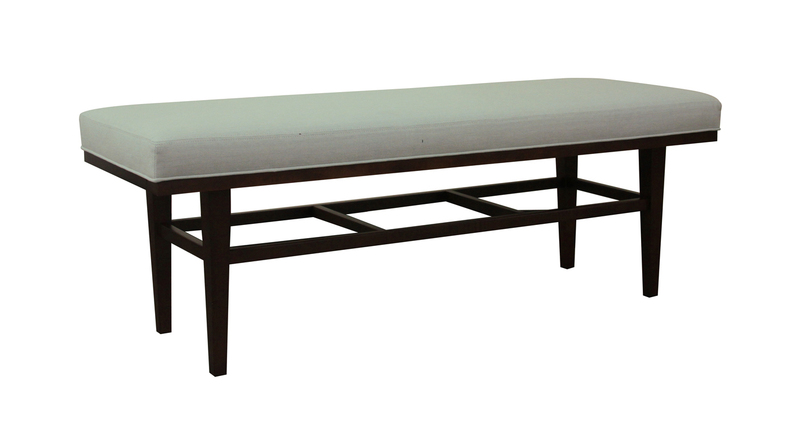 and Lacy’s suggestion for a stone topped table could be great (again, marrying the molding’s white, the sofa’s ivory, and the rugs grays) into one natural palette, itself then a perfect party-companion to the window’s natural grasses. I love the finish and nesting sides of Ethan Allen’s Evan Coffee Table if we’re sticking to stone. 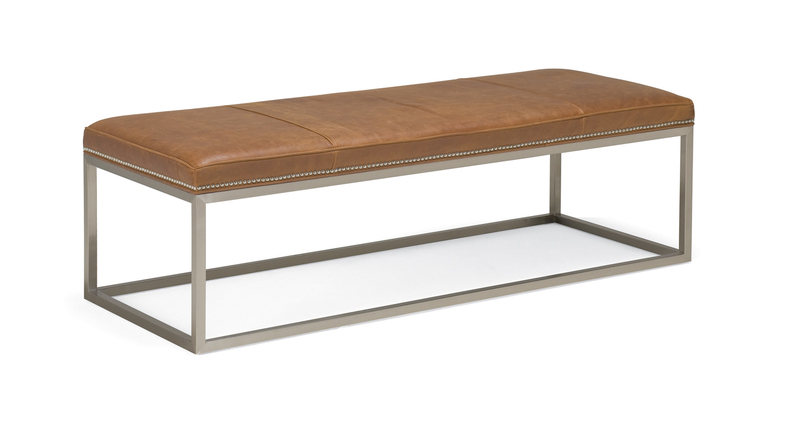 Aside from stone, I love the shape, modern air and hardwearing leather top of the Mitchell Gold + Bob Williams Duncan Coffee Table Ottoman, or their vintage-y Nash. Of all these, the EA Evan or the MG+BW Duncan are my strong frontrunners, and worth the slightly higher investment value…. Just keep an eye for sales, which both vendors frequently offer. 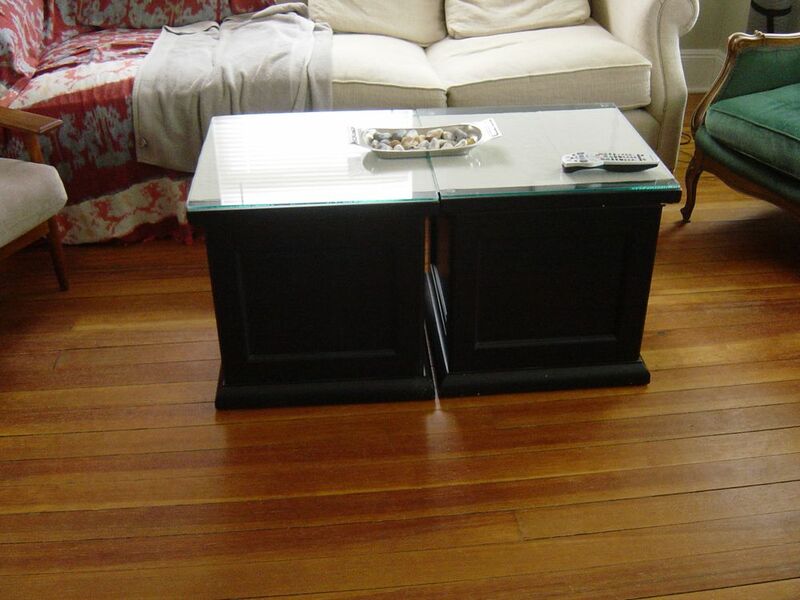 All these would be perfect if the side tables stay the cubes. If side tables go airier, the coffee table can get a little more heft and visual weight… the Wisteria Avant Garde table, for example. 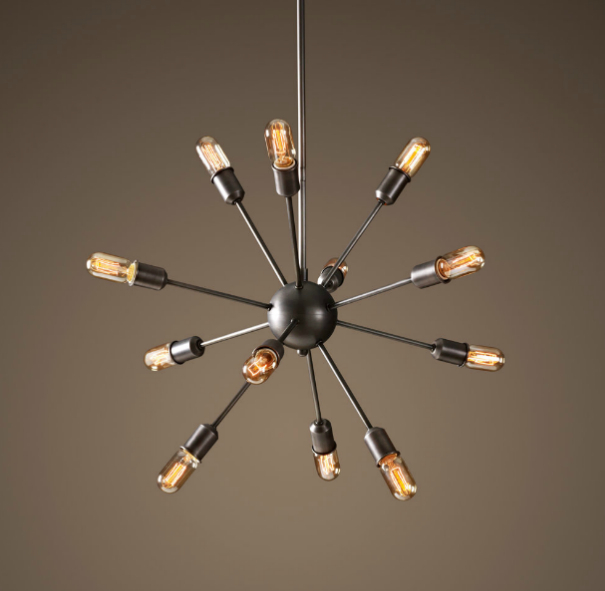 Every room needs lots of lighting options, and without fail, I find that people underlight (and "under lamp") rooms. 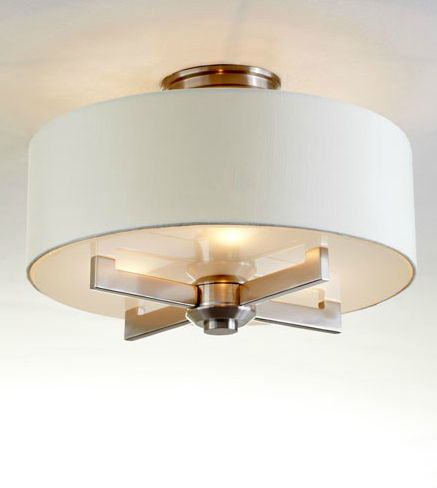 Lacy is willing to forego both the living room’s ceiling fan and the dining room’s pleasant but underwhelming (in style and scale) fixture. Remember, the dining room overhead fixture is a big part of the “picture” we’re orchestrating here, against the newly-redressed window wall. 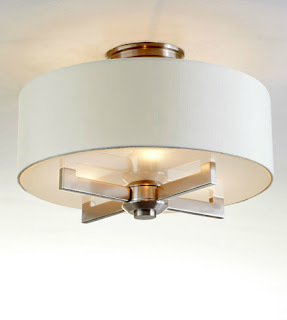 To get that dining room fixture exactly where you want it (not centered over the table) use an oversized ceiling medallion to hide the source of the wiring when the new fixture is ceiling mounted, like this simple version from VanDyke’s Restoration, which could easily look like it came with the house. I am NEVER a fan of a general overhead light in a living room, with recessed or track lighting the only exception, but here, they’d be too modern for the space. 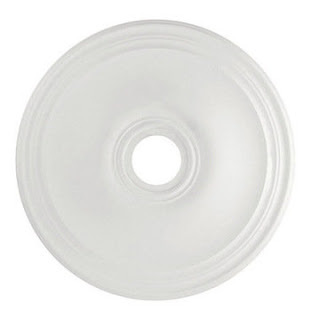 So I’d do something simple, pretty, and ceiling-hugging, that perhaps feels of the vintage of a past renovation, like Horchow's Silver Satin Ceiling Fixture. But honestly, I’d never turn it on except during some serious Spring cleaning. But in the dining room, we need JEWELRY. 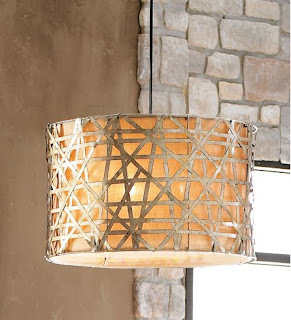 And even in a traditional home, I love more modern or and more exotic lighting. I’d even break the metal-matching rule here, and go with something brassy or gold to the rest of the space’s nickels and silvers. This is your most entertaining party guest, so make it something with great personality. My first choice for Lacy would be the Currey & Company Confetti Cube Pendant (How’s THAT for a party guest??). 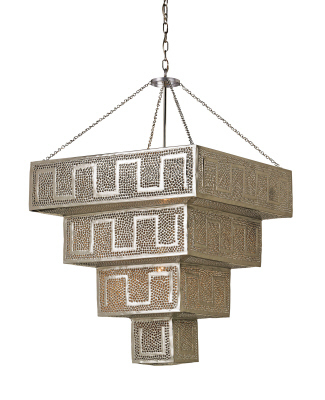 Also consider Horchow's Alita Basketweave fixture, shown further above. 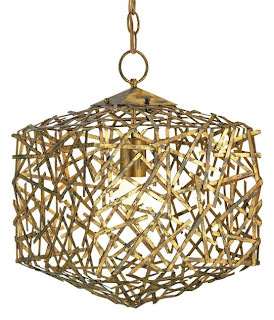 Another option could be Currey’s Arabiah Pendant (an transportive companion to the exotic Ikat in the chairs) or the equally high-profile Sputnik Filament Chandelier from Restoration Hardware, but I’m betting good money the eagle-eyed Lacy could also find the perfect vintage fixture in her travels. 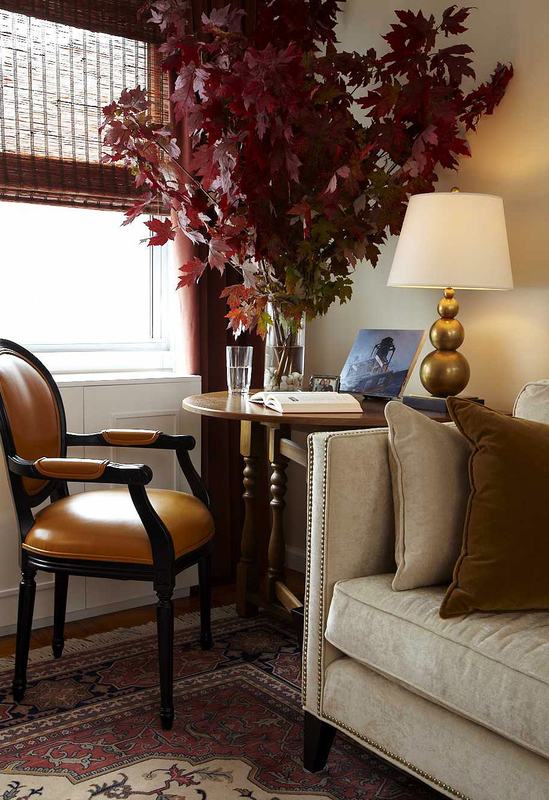 Back to the living room: I’d consider Wisteria’s Sleek metal and marble accent table between the two vintage chairs, in their new home centered on the bay windows. Reupholster those two chairs in a designer to-the-trade fabric… a great place to splurge, since the design of these chairs is sparing of yardage. Finally, add a basket or two (like these from Horchow) beneath the legs of a side table or atop the Medici Secretary Desk. And remember, a little room (the front living room is not ginormous, and still needs to function as circulation) can take way more furniture and layered detail than you realize, and this space is no exception. But Lacy is most certainly up to the task! Hopefully this plan lets her add pieces as she goes, with a cohesive but collected end goal in sight. What did I miss? What would you do to design Lacy’s space? I’ll be eating my scone while you think about it. Get social! 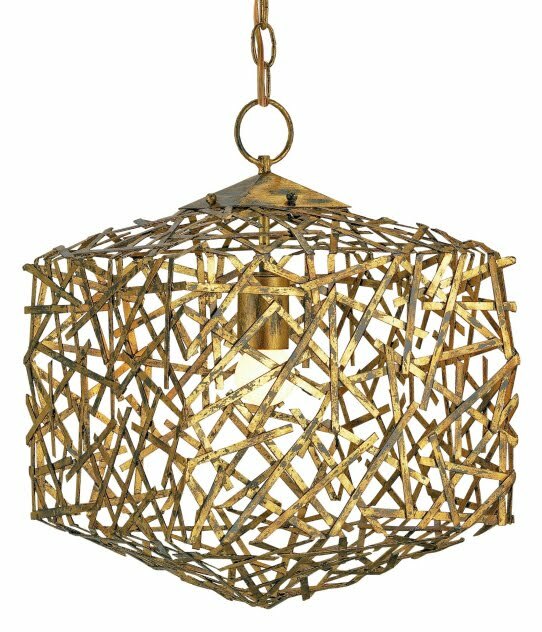 Find Mitchell Gold+Bob Williams, Ballard Designs, Horchow, Pottery Barn, West Elm, Currey & Company, and Wisteria on Facebook. Beautifully done.I see X's and O's in this room..EVERWHERE..Subliminal? Sandy! Not intentional, but now that you mention it! Funny! And appropriate. A VERY sweet couple. CityMinx-- I'll hold you to that! !